Capabilities of cameras differ depending on their function and environmental condition. As we have installed quite a number of cameras for home and building owners, we may say that most of these customers choose simplicity and attractive design rather than higher resolution sensors or zoom features. We offer cameras of neat and discreet design, which can both suit well your office or home interior and operate at full capacity. Out of large selection of cameras on the market, we help choose exactly what our customer needs. There are factors of view options, connectivity, cloud storage and price, which have to be considered together with aesthetics. We help you define the product, offer professional installation and make sure our customers learn well how to use the system easily and for their benefit. A place called home has to be protected. In New York City with its millions of inhabitants, protecting your property from breaking in or any acts of vandalism is an issue that can’t be ignored. At DNY Security we work with homeowners and provide the optimal solution for maximum security. Our professional camera installers will offer various surveillance systems for your particular case to ensure the best coverage and the best price. Installing cameras will let you minimize the risk of suffering from burglars or spot any suspicious character around. Sometimes cameras visible from the exterior part of your house can act as a serious deterrent for potential intruders. Professional surveillance systems allow you to control all the activities near your home and even protect you against being a target of frivolous claims in case some incidents happen on your property. The technologies we use will make it possible to give you a remote live view as well as a remote playback. Using your iPhone or Android device, you can have a live picture of what is going on with your property while you are away. 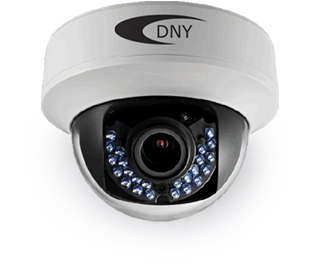 At DNY Security we feature a broad array of professional quality surveillance systems. Our camera installers will easily go over your case and consult on every item of the product we offer. Once the equipment is installed, we make sure you understand how to use it to avoid any difficulties after installers leave. Talk to us in case you have any questions or wish to schedule a consultation or a meeting. At DNY Security we create reliable surveillance systems and work thoroughly with schematics first. In case you already have a design of security system worked out for your particular space, we can consider it and make proper recommendations or remarks. Please contact us and our installers will schedule an appointment to inspect your home, office or business area and will make a free estimate. Being a technology and service company, we provide up-to-date surveillance systems and top quality installation. We believe in the expertise of our CCTV installers and are sure they will answer all your questions whether they are about cameras’ features or any complicated incidents that might occur in process of using the installed system.